My mom, sisters and I have talked a lot about taking an adult girls only trip, yet no plans have ever been made. So I decided to make the plans. I wanted to take my mom away and invited my two sisters to join us. Unfortunately, my older sister couldn’t get the time away from work so my younger sister and I took off to Michigan’s west side for a getaway with our mom. 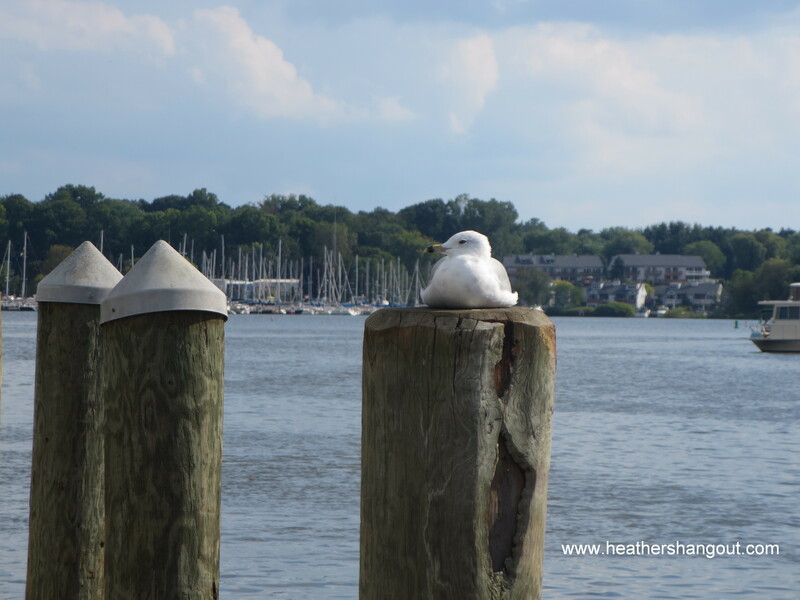 Our destination was Saugatuck, one of my favorite small towns, sitting on the Kalamazoo River. I’ve visited Saugatuck many times and I always have a great time. Which makes for a great trip! I love the people, ambiance, shops, small inns and bed and breakfast inns, restaurants, and beauty. Saugatuck is approximately 2.5-3 hours from the Detroit area, between Grand Haven and South Haven. It’s often connected with its immediate neighbor, Douglas. The area is known for the art and music life. There are numerous activities and events hosted throughout the year. Even the birds enjoy relaxing by the river. We stayed at the Ship-N-Shore Hotel on Water Street. It was one of the best rates for the summer season and had ample room for three of us. In fact, they have made many updates to the lounge area and rooms since I stayed there a few years ago. I loved our vaulted ceiling and tile floor. Our room had a view of the river, which was so pretty and peaceful as boats cruised by. We made use of the outdoor patio tables by enjoying some adult drinks upon our arrival. I also like the location of the hotel as we can walk to all of the downtown stores and restaurants. And we definitely walked….and shopped. We enjoyed a nice lunch on the deck at Coral Gable, where we could view the impressive boats docked in the marina. We then meandered through many stores, before relaxing in the hotel lounge before dinner on the deck at The Butler restaurant. We splurged on dessert at Kilwin’s Chocolates (shhhh) – dark chocolate covered pretzel with cherry wine….yum! After some funny girl talk, we fell asleep (it was like old times sharing a bed with my sister – we shared a room growing up so I secretly enjoyed being together again). Another awesome summer Michigan day greeted us the next morning. We wandered through the marina and enjoyed a leisurely walk through town. 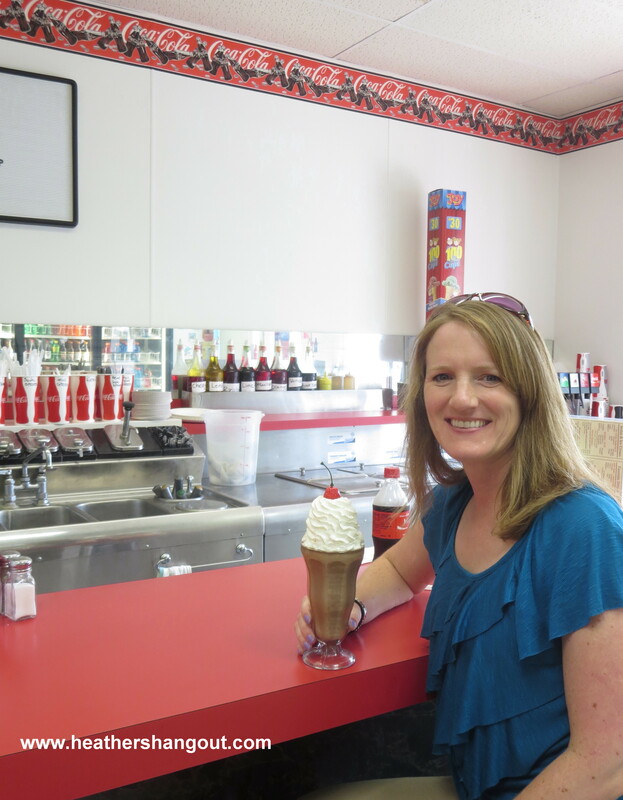 My sister and I found a soda fountain bar in the back of the Saugatuck Drug Store which we stumbled upon without even looking for it (sometimes the best find!). It was fun watching them prepare fountain drinks and seeing the “old-fashioned” decor. However, you definitely can not be in a hurry when ordering. Hanging out at the soda fountain. One store new to Saugatuck is It Is What It Is on Butler Street. Nestled the past four years in neighboring Douglas, the store owners moved their location to Saugatuck when storefront became available. They commented that foot traffic and sales have soared since their move. I loved the store (in fact, visited three times!). Great home decor and gift ideas. A slew of their items are by local artist, Katie Doucette from Polka Dot Mitten, who happens to be their daughter. Her inspirational, original art items were cute, fun and sassy. I bought a few items from the store and am excited to learn that Katie’s items are also available in stores in southeast Michigan. I am so happy to have the time with my mom and sister (although we missed not having my older sister with us so the next girls’ getaway will definitely include all of us.). It is important to dedicate time to people important to us, and these women are two of the most important people in my life. We share so many memories and love. It’s nice to reminisce and also share thoughts and plans for the present and future. I liked that we could spend time talking and, most importantly, listening to each other without interruption and in a relaxed atmosphere. And, of course, exploring more of our beautiful home state was awesome!